We have attended both the Poteet and Pasadena strawberry festivals—the only two of their kind in Texas. Poteet (outside of San Antonio) holds theirs in April while Pasadena’s (in the Houston area) event is this month. We enjoy experiencing the energy in the carnival-like atmosphere, seeing cute strawberry mascots and royalty (scholarship winners) wearing red walking around the festival grounds and tasting everything made with strawberries (shortcakes, ice cream, jams and jellies, drink mixes and more)! It is also getting warmer (hot!) in Texas so we like to cool down with something light featuring this month’s fruit: strawberry salad with balsamic-yogurt dressing. Strawberries are abundant now at our local grocery stores and we buy them in bulk there, if not at the festivals. For National Strawberry Month, mix some fruit with vegetables and make a strawberry salad with balsamic-yogurt dressing. In a bowl, combine the olive oil with the balsamic vinegar. Stir in the minced garlic. Add the maple syrup or honey. Season with salt and pepper to taste. Stir in the yogurt. 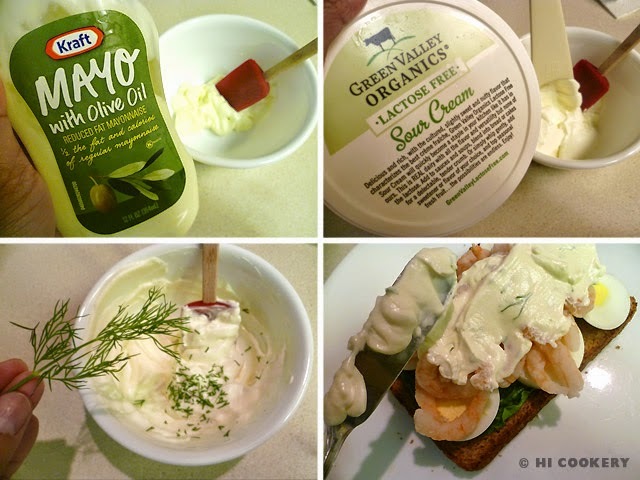 Mix until the salad dressing is creamy. In a salad bowl, place the mixed greens. Sprinkle feta cheese and bacon. Arrange the sliced strawberries on top. Pour about 3+ tablespoons the salad dressing. Sprinkle the toasted almonds. Serve immediately. This is a colorful and complementary salad. The greens are balanced by the red strawberries (like on the color wheel) and the bitterness of the vegetables is tempered by the sweetness of the fruit. Search our blog for more strawberry recipes. Many people think that barbecues involve a grill. This recipe for char siu involves an oven. Char siu, Chinese-style barbecue pork, is one of Islander’s comfort foods. After church on some Sundays, her family would go to Chinatown in Honolulu and buy a piece of red pork meat hanging by the Peking ducks in the windows of Asian grocery stores. Sunday dinner was simple: char siu, sticky white rice and a vegetable side dish (see Notes). Char siu is also chopped up as a filling in manapua (Hawaiian word for char siu bao—Chinese buns) or sliced as a garnish for saimin and fried egg noodles. While it may be simple to buy it ready-made at the store, it is quite easy to make char siu at home. Meat is marinated in an auspiciously red sauce (which freaked out Highlander the first time he saw it in our refrigerator looking like something from a horror movie/insane asylum). It is then baked in the oven (which makes this seem more of a roast than a barbecue). Islander especially loves the char in char siu—the blackened parts of the juicy pork from being caramelized! Try this baked BBQ recipe for Chinese barbecue pork as something different on National Barbecue Day. Char siu is also appropriate throughout National Barbecue Month in May. In a large bowl, combine the hoisin sauce, honey, soy sauce and sherry or rice cooking wine. Stir in the sesame oil, Chinese five spice powder and red food coloring. Mix well. Cut up the pork and place in the bowl. Cover with plastic wrap and marinate for a few hours (overnight is best). Remove pork from the marinade and let the sauce drip back in the bowl. Place on a foil-lined baking sheet (easier for cleanup). Bake in a preheated oven at 400 degrees F for around 45 minutes or until the pork is cooked through (adjust cooking time for different pork parts). Remove from the oven and let the pork rest for a few minutes. Slice and serve. Suggested vegetable side dishes to char siu and sticky white rice: sesame choy sum, bok choy or green salad. August 7 is also National Barbecue Day. Highlander had to undergo fire safety training for his job in the oil and gas industry. Even with his background and reassurance (plus the fire extinguishers he put around the house), Islander is frightened about flambéing her fruity foods (Crepes Suzette, Cherries Jubilee, Bananas Foster, etc.). So she found a simplified and shortcut Crepes Suzette recipe, which uses store-bought crepes and marmalade for the “Suzy Sauce”. The orange-flavored liqueur is still included as an ingredient but it does not have to be ignited. The alcohol cooks off in the heat and the sauce is still sweet for this delicious dish. For a fast French food without the flame, make Crepes Suzy for National Crepes Suzette Day. Bon appétit! In a large skillet, melt the butter over medium low heat. Stir in the orange liqueur and brandy. Simmer on low for a few minutes to cook off the alcohol. Mix in the orange marmalade and bring to a slow boil. Reduce the heat. Add a crepe to the sauce and quickly fold it in half, being careful not to let it soak or it will get soggy. Fold in half again and transfer to a plate. Continue folding the rest of the crepes one by one in the sauce. Arrange crepes on a plate, layering a few on top of each other. Garnish with orange slices. Spoon some more Suzy sauce on top of the crepes and orange slices. Read various versions of the historical origins of the recipe for Crepes Suzette. Search our blog for other French food recipes. San Antonio, Texas, is famous for its fiestas. When we lived there for six super happy years, we celebrated by eating many Mexican dishes with our familia and friends, including ceviche, a dish that contains raw seafood “cooked” in citrus, usually limes or lemons, and tossed with tomatoes, onions, jalapeño peppers and cilantro. 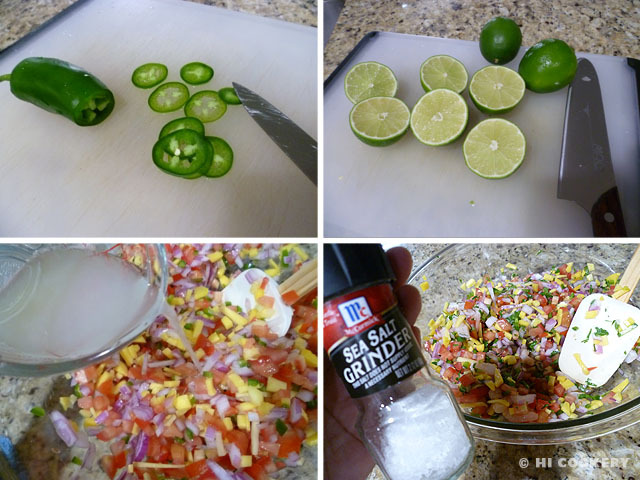 Since Islander is not too fond of fish, she found a ceviche recipe that contains shrimp cocktail. Mango is added to the mix for a vibrant color and a slightly sweet surprise. Ceviche de camarones y mango reminds us of the confetti inside the cascarones (eggs that we liked to smash especially on unsuspecting people’s heads!). This appetizer can be eaten alone or served with tortilla chips. 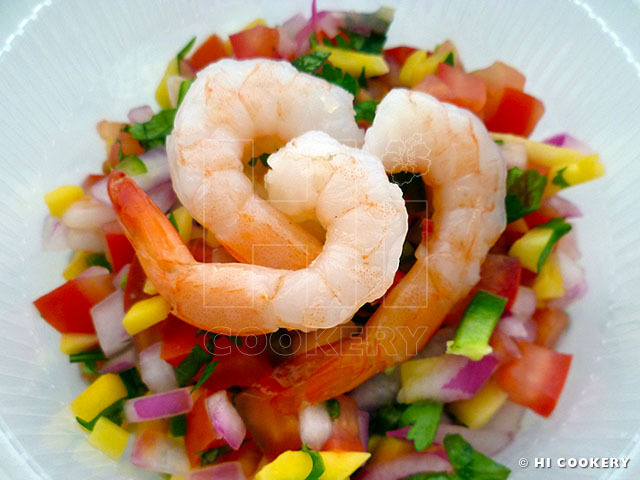 On Cinco de Mayo, serve ceviche with shrimp and mango for a fun and flavorful fiesta. Rinse the shrimp and pat dry with paper towels and discard the tails. Cut into ½ inch pieces, reserving a few shrimp to garnish (optional). Chop the onion. Dice the tomatoes. Chop the mango (one cup) and jalapeño pepper. Place the chopped ingredients in a big bowl. Pour the lime juice over the mixture and combine well. Sprinkle with cilantro and salt and mix again. 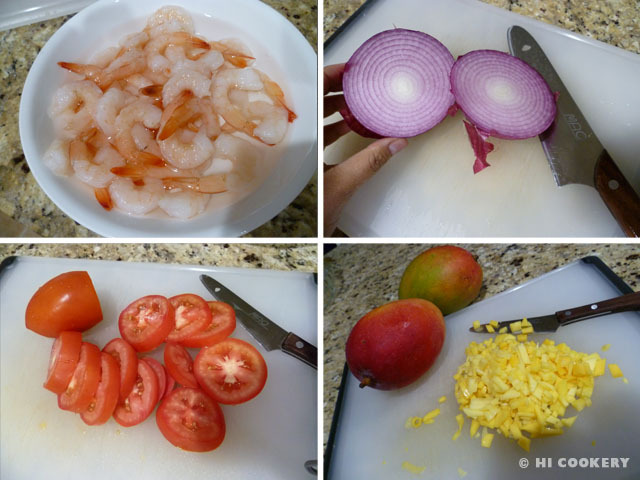 Cover and refrigerate for an hour to allow the flavors to develop and the citrus from the lime juice acid to “cook” the shrimp. Serve chilled in a margarita glass, garnished with shrimp. Or place in a small dish/bowl surrounded with tortilla chips. If raw seafood is a concern, replace with ready-to-eat cocktail shrimp. Further the fiesta fun and serve ceviche de camarones y mango on National Shrimp Day on May 10. Search our blog for other Mexican recipes. ¡Viva Fiesta! Islander used to work in a building across the street from an Ikea in Illinois. What a distraction it was to go to that Swedish furniture store (we bought a sofa sleeper, end tables, cabinets and shelving, benches and stools and a mirror from Ikea)! 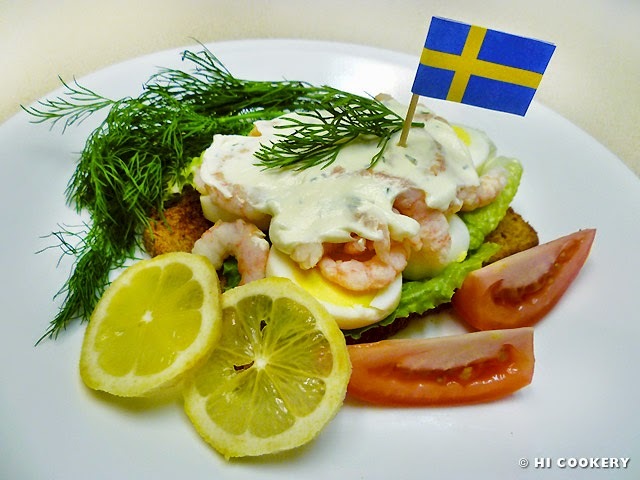 Sometimes, Islander would take her lunch breaks at the Ikea cafeteria to sample some Swedish food, such as räksmörgås, an open-faced shrimp sandwich. It was light and refreshingly delicious. Now that we currently live in South Texas, the closest Ikea is nearly three hours’ drive away—not too convenient to visit for browsing at furniture or eating at the café. So we make räksmörgås at home. 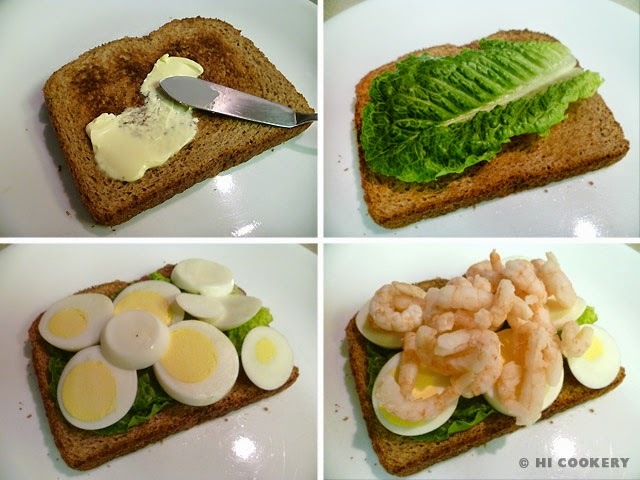 These Swedish shrimp sandwiches are simple to make for a light lunch and in observance of National Shrimp Day. Smaklig måltid (bon appétit in Swedish)! Toast the bread. Spread butter on one side. Place a lettuce leaf on top. Slice the eggs and layer it on top of the lettuce. Sprinkle the shrimps over the eggs. In a small bowl, mix together the mayonnaise and sour cream. Stir in the chopped dill. Carefully spread the mixture over the shrimp. Finish with dill on top. Garnish with lemon slices, tomato wedges and a sprig of dill (optional). Serve immediately. Variations of räksmörgås include adding mustard, thinly-sliced cucumbers, chopped chives, lemon garnish, tomato wedges and caviar. Heavier breads, such as rye or pumpernickel, are recommended over the softer white varieties to be able to hold up the ingredients. Search our site for other Swedish-inspired or shrimp recipes.